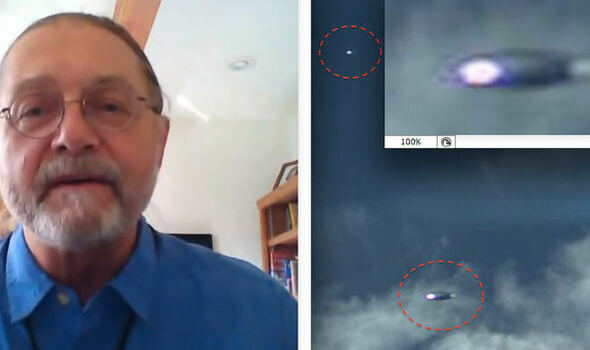 Dr Richard O’Connor, 60, has snapped almost 280,000 pictures using two motion detector cameras which are locked on the sky at his home in Helena, Montana, USA.But he believes the latest few include the long-sought evidence of alien-flown UFOs (unidentified flying objects). After he posted them online, a fury of debate erupted among the UFO community, with some suggestions they were fake or not conclusive proof.Now Dr O’Connor is enlisting more photo experts to examine his captures.Some have claimed Dr O’Connor has not come into the research impartially, as he has been a long supporter of the crop circles being caused by aliens myth and heads the Crop Circles Research Foundation.He is also a believer of the 1947 Roswell “UFO crash” incident in New Mexico through his friendship with Jesse Marcel Jr, whose father Major Jesse Marcel is said to have shown him, when aged just 10, pieces of wreckage from the alleged UFO crash at the time. Dr O’Connor put up two Reconyx Hyperfire PC 900 Trail cameras 30 feet high on the southeast corner of his house, hoping to catch some evidence of UFOs if they set off the motion detector.When triggered by motion, the cameras, which are about 30 feet off the ground, shoot 20 photos at approximately 1-second intervals. The cameras shoot 20 photos at one second intervals if activated and this has seen him snap several birds, squirrels and wind-blow treetops.But he finally snapped what he says he has been looking for – proof of UFOs – this winter.He said: “Basically what you see it a very symmetrical, smooth and reflective surface that appears to have his own light source.”He says he has no knowledge how to manipulate images and has sent the stills to the National UFO Reporting Center (NUFORC) which investigates and keeps a database of UFO sightings.Peter Davenport, head of NUFORC, sent them to a photo-analyst for further investigation.The unnamed analyst said: “Bottom line, I think the images are real, but remain a mystery.“I suspect the lights in the first and last photos are sun reflections off of something rather than any propulsion system.“Thus, I conclude it is a puzzle to solve rather than a fake.”However, a separate analyst, who looked at them, suggested they were “100 % fake, ” angering Dr O’Connor who swore to take a lie detector test over them.